Andy is an eclectic type: An amateur radio enthusiast (used to chat with MIR), amateur radio astronomer and keen on other space-related amateur radio projects. He says: “More than twenty years ago I recognised my long-term interest in space exploration, but it was only when my father died that I met again the radio ham community that I had been with in the late 1960s, and who were who were now in contact with the cosmonauts and astronauts in space. We, they, remain, the ‘common people’ who reach out into space.” Andy will join #SocialSpaceWA next week At New Norcia (and is the only participant from outside of Australia!). 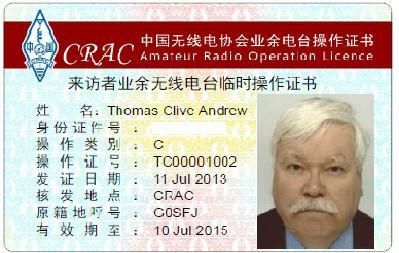 Andy Thomas G0SFJ-CRAC – the first-ever #SocialSpace participant with a CN ham radio license?